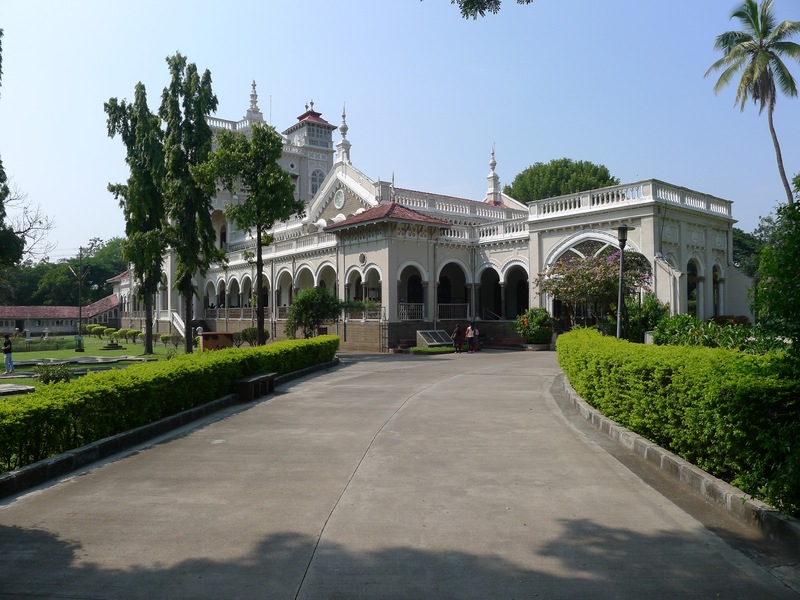 Amin, auto rickshaw driver extraordinaire, took us to Aga Khan Palace today. 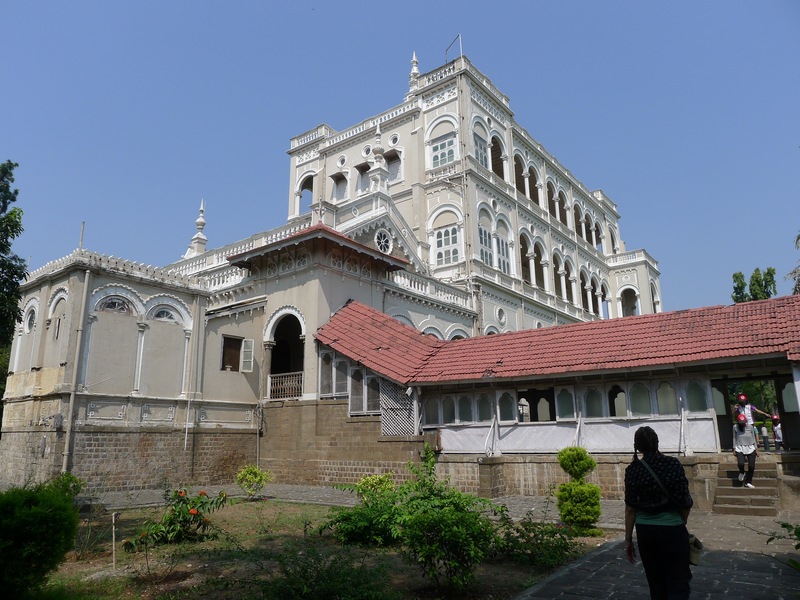 Originally built in 1892 by Sultan Mahuammmed Shah Aga Khan III as an act of charity to help the poor in the area of Pune suffering from famine, the palace now holds the Gandhi Memorial and the organization that runs it. 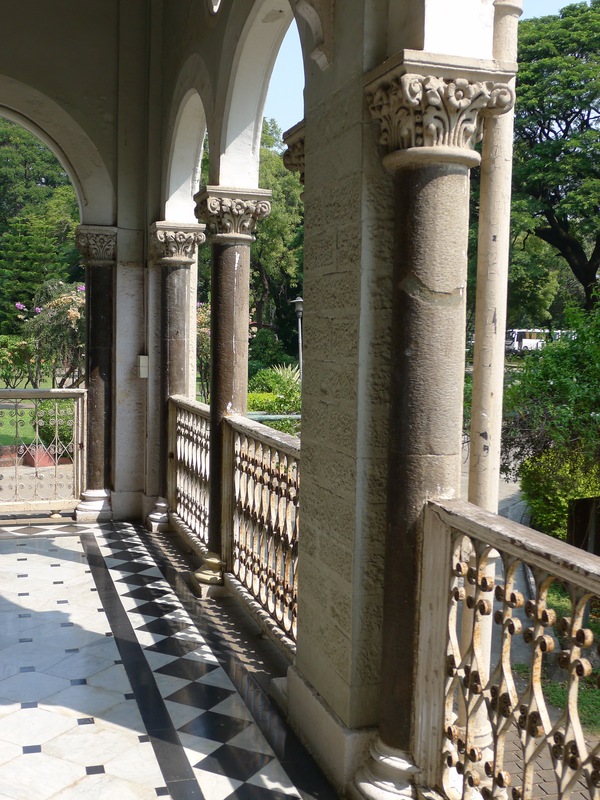 Mahatma Gandhi, his wife Kasturba, and his secretary Mahadev Desai were all imprisoned in this Palace between August of 1942 thought May of 1944, following the launch of the “Quit India Now” movement. During that almost two year time period, both Kasturba and Desai died. 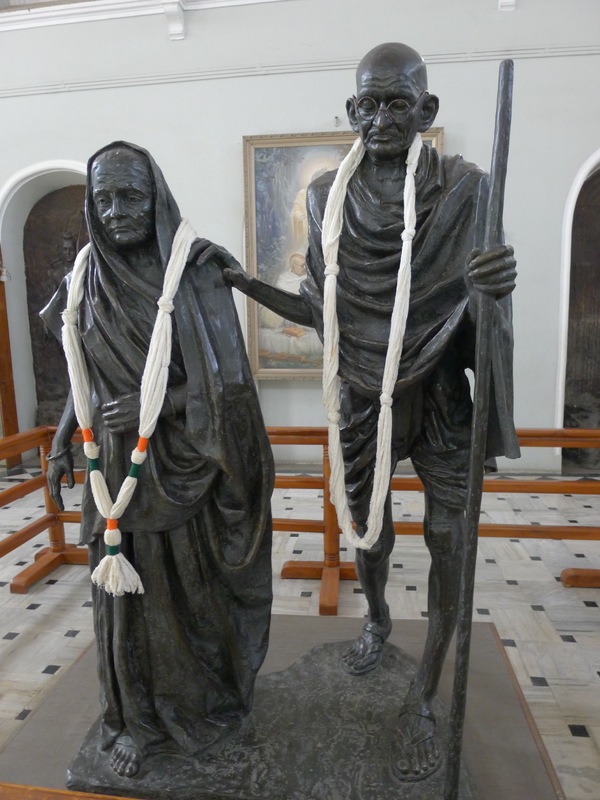 Their “samadhis” are on the grounds as well as some of Mahatma’s ashes. 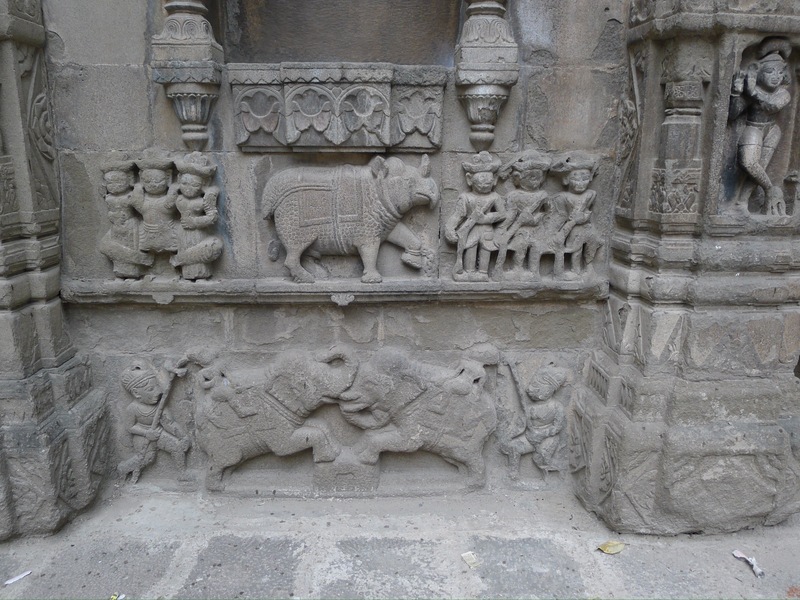 In 2003 the Archaeological Survey of India declared the place a monument of national importance. There was a group of kids all wearing red ball caps that said “Adventure” on them. There were several photographers and their pre-wedding parties there capturing shots under the arches and on the grounds. And then some smaller families. It wasn’t crowded and we could take our time and photos. And nobody asked us to take our photo. The building seems in good shape but the exhibits need some work. 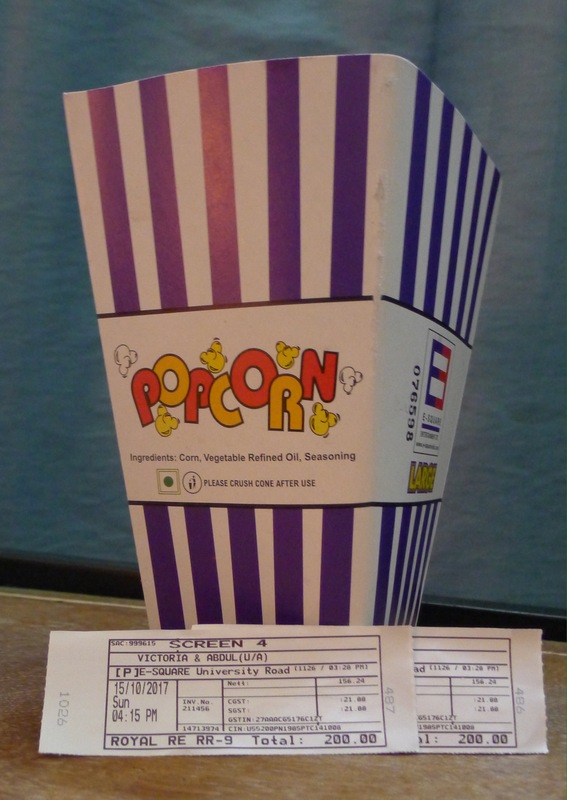 I appreciated that the explanations were in English (always a bonus). Our flat mate Lally left for England this morning so last night was our last meal the three of us shared. Aneeta outdid herself and made coconut rice, which was extra delicious. 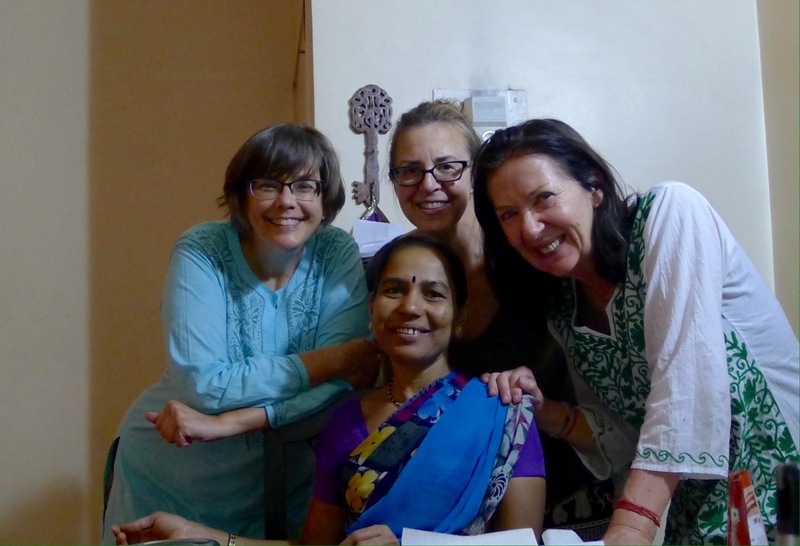 We took this photo of the four of us using the 10 second timer, which Aneeta couldn’t seem to wrap her brain around. We all like it so much I went to the photo place down the road to get a print so Aneeta could have a copy. It is one of these places that is a single garage door size wide and maybe just a single car garage (maybe smaller) deep. The woman behind the counter and I had a conversation that consisted of one word sentences/questions and that sideways head bob, that is so prevalent here, that means “yes”. And, after me getting behind the counter and sitting at her desk to download the photo from my camera to her computer, we were in business. Five minutes and 50 rupes later, success! 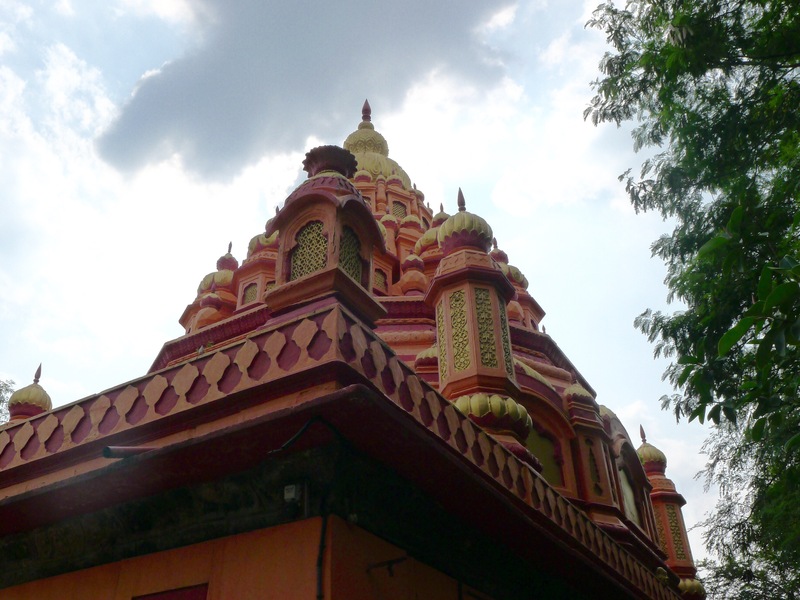 And here are some photos of Trishunda Mayureshwar Ganpati Temple. Notice the guy hanging out on the balcony on the apartment next door noticing us? “Hill stairs” was a new term for me. It means just what you might think: a hill (or slope) with an occasional stair. To get to the top of Parvati Hill there are 103 of these stairs each separated by a slope of about five or six paces. So, the entire time you are going up (or down as the case may be). It is 283 feet from the base to climb to 2,100 feet above sea level. 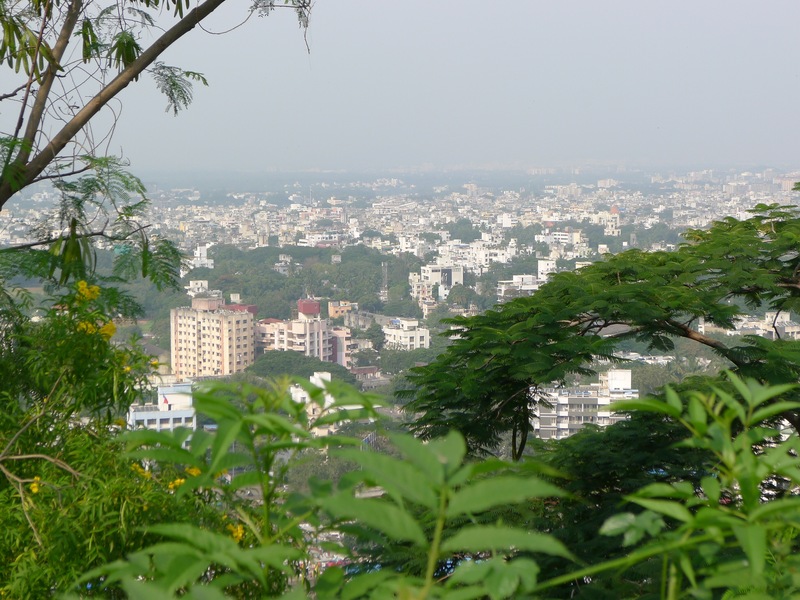 The long climb affords a view of Pune. This is the second highest spot in the city of 3.12 million people. 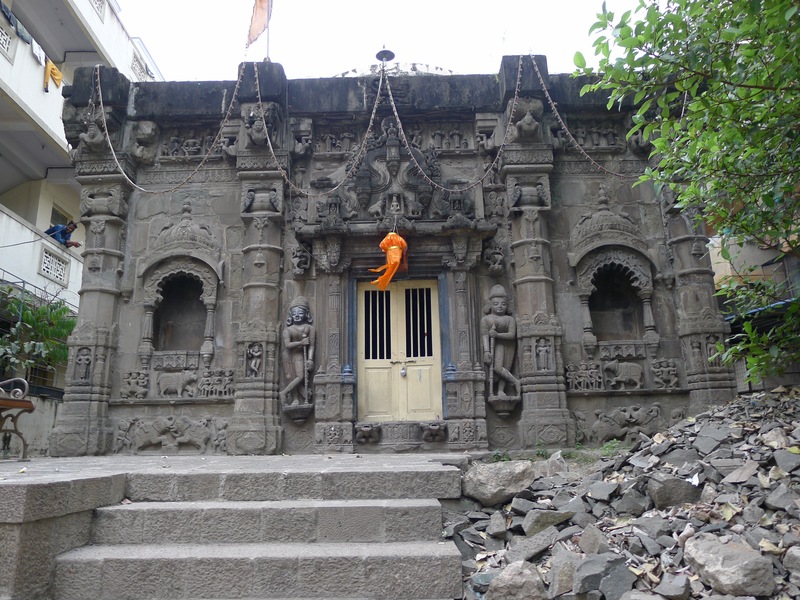 Atop the hill is the oldest heritage site in Pune. Built during the Peshwar dynasty (I am guessing in the mid 1700’s) there are five temples, a museum, and a display of the leaders of the dynasty along with a map of the area under their rule. 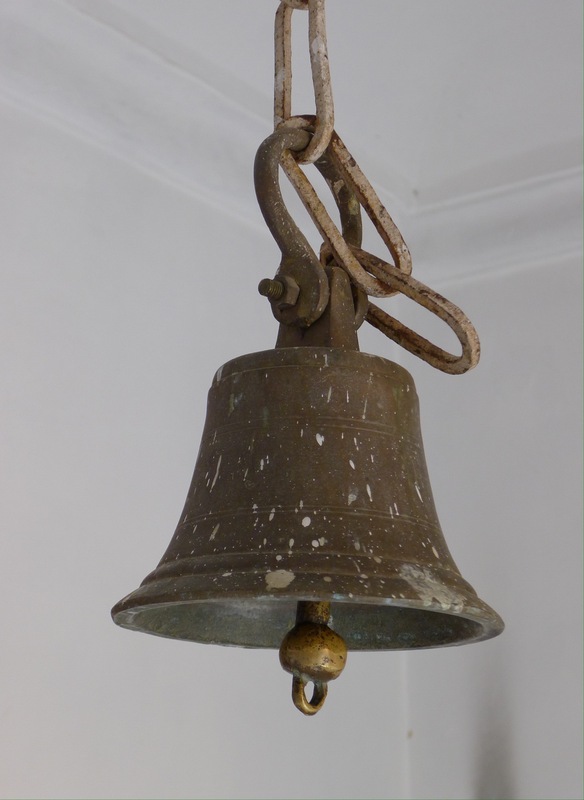 When people come into a temple they ring the bell, go up to the railing or door and usually press their palms together in the classic namaste position. Of the very few I have witnessed they don’t stay very long. 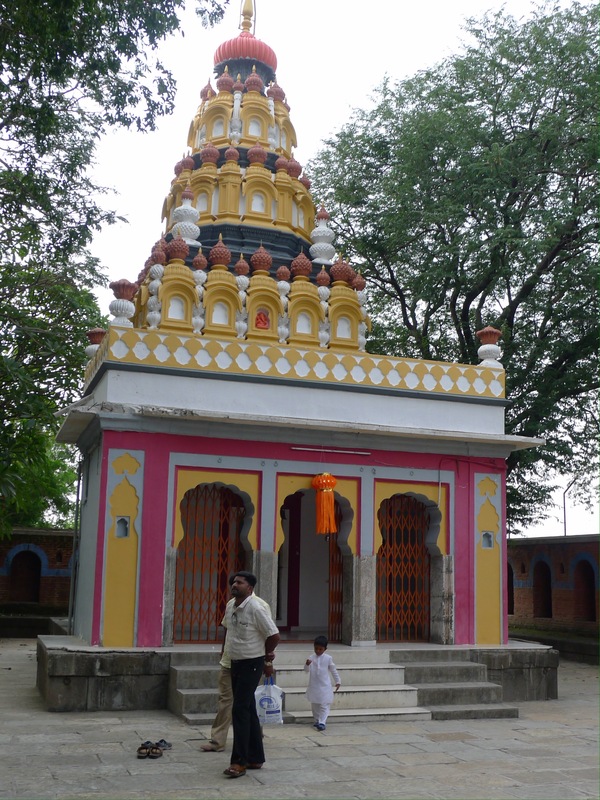 Each temple is usually devoted to a different god, Ganesh, Shiva, Parvati, etc, and there is usually an idol of that god in the temple. 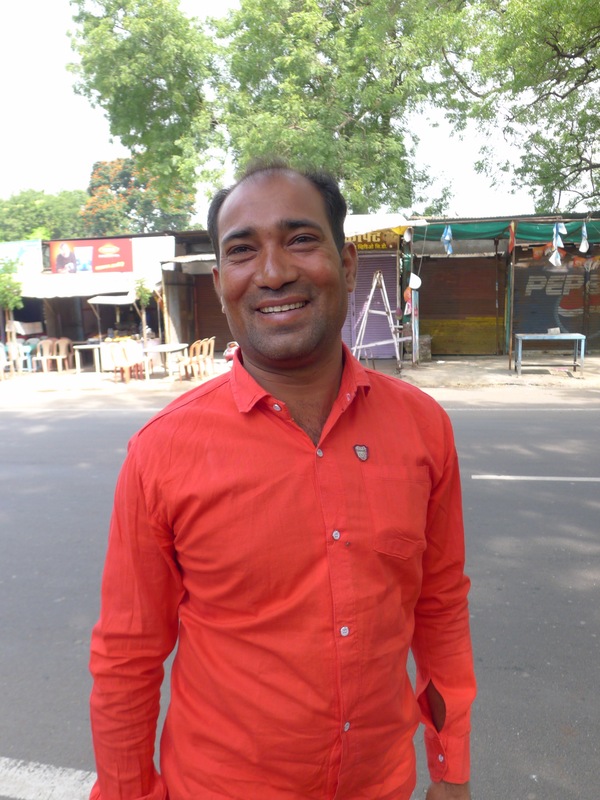 We got there and back in an auto rickshaw driven by Amin, a friendly, affable guy with an easy smile and one of those deli like hats I see many men when he dropped us off I asked him about the hat and he said “It is a Gandhi hat”, as if that explained everything. After Parvati Hill he took us to a big grocery store that had three levels and to get from one level to the next there was a “travelator” another new (made up?) word. It is a combination of those moving walkways that are in airports and an escalator (minus stairs) so your grocery cart can go with you. The wheels the travelator must be magnetic because the cart sticks right to the sloped moving walkway. 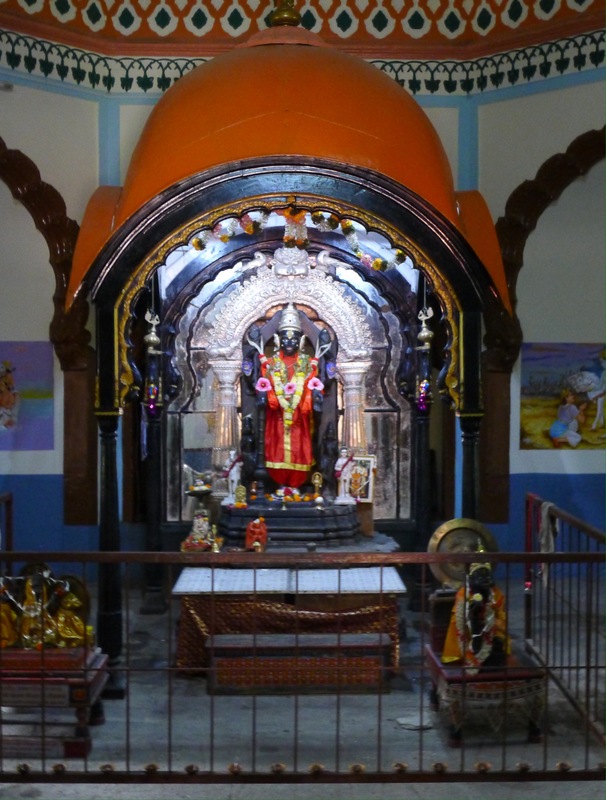 And, without asking he gave us a ride down the back roads (no traffic) of an old part of Pune to Trishunda Maayureshwar Ganpati Temple (which I had to do a Google search to find post visit). 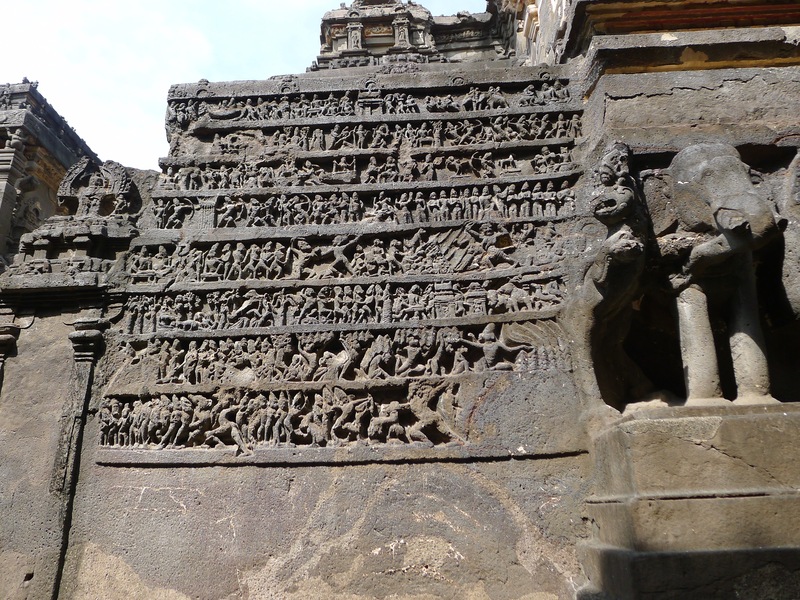 It was very beautiful with carvings not unlike Ellora, albeit much smaller and built much later. Building started in 1754 and ended in 1770 it is just a part of the current fabric of the neighborhood, as all these temples often are all around town. It started to rain so we hopped in the rickshaw and took another wet ride back to Hare Krishna Mandir Rd, home base. The cold rain soaked my left shirt sleeve and pant leg. The reprieve from the heat felt so great. We are an anomaly here and get looked at, especially when we are in public places where there are mostly local people. 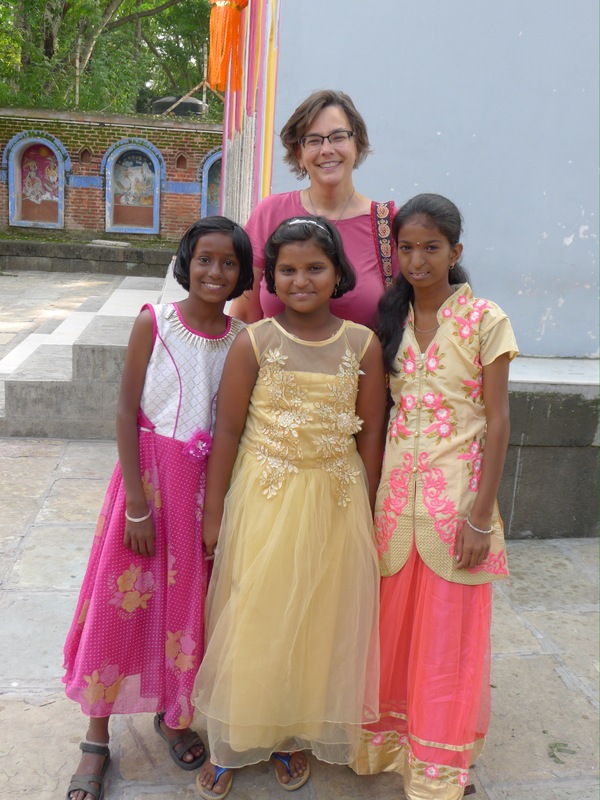 Yesterday Lorene and I visited Parvati Hill (next blog post) and were approached by two groups asking to have our photos taken with them. One group consisted of seven or eight 18 year old girls who were shy about asking us. Once we had our photo taken we asked them their names and how old they were. They recited their names and, even though they sound so beautiful they are complicated and impossible for me to remember. The other group we had no conversation with except to agree to be photographed with them. There were maybe six or so of them, likely family members. When the auto rickshaw driver stopped at the bottom of the hill he warned us that we might get asked to be photographed. He suggested it was okay to agree to have our photos taken with the young boys but not necessarily the older “crazy” ones. These three girls were hanging out with who I assumed was their father who was reading the newspaper. They giggled and whole heartedly agreed to have their photo taken with me. 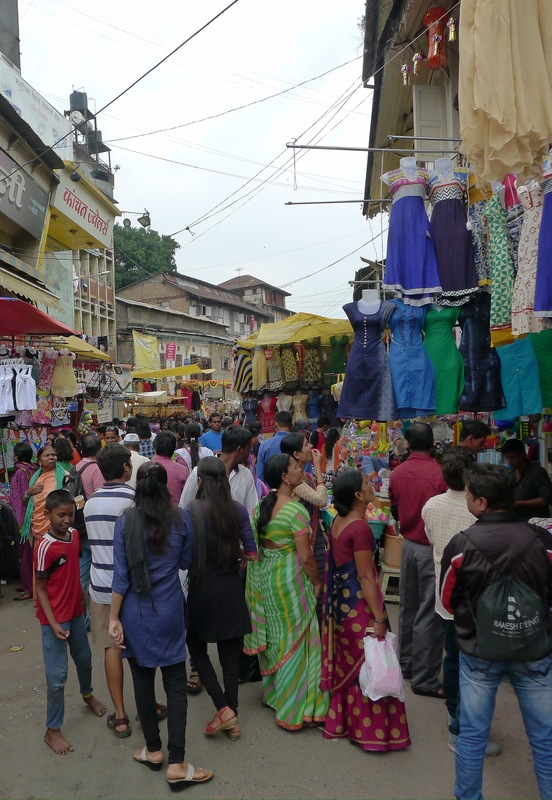 Four of us, Maggie, Lally, Lorene and I, went to Laxmi Road today, a renowned shopping area in the center of Pune. 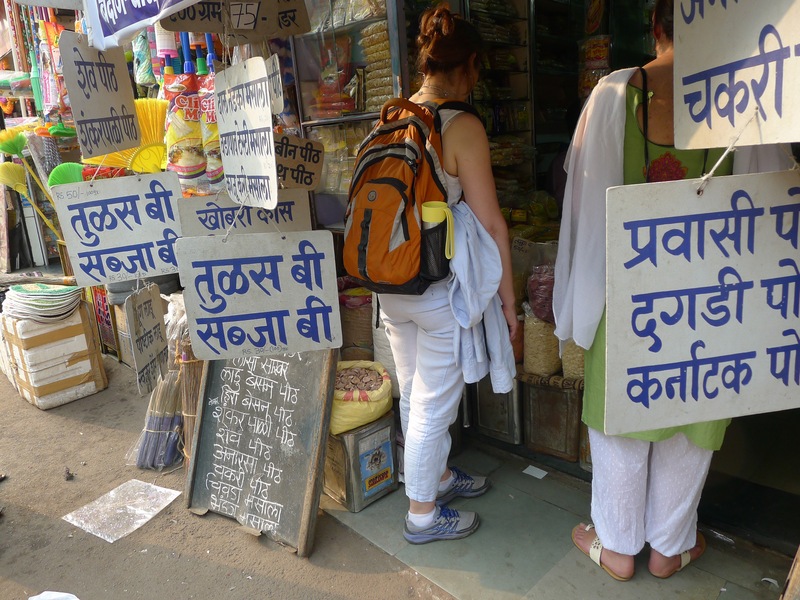 A short 50 rupee auto rickshaw ride delivered us into a mass of humanity and shops. It was crowded, not a Western face in the mix, in the street and in the shops. We ducked into one of the pedestrian only streets, which at least eliminated the rickshaw, bus and motorcycle traffic. There are tiny shops, their goods spilling out the door onto carts and displays. 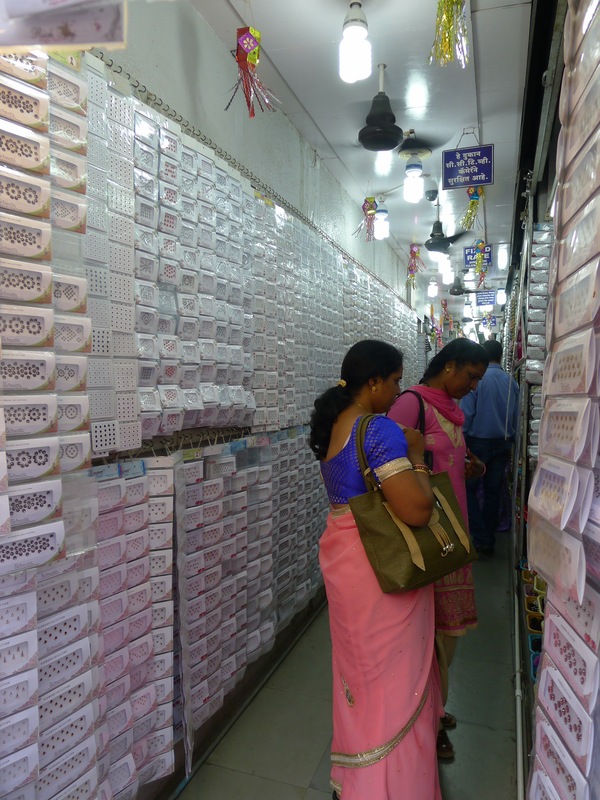 There are kitchen goods, flowers, saris, bindis, shoes, scarves, purses, jewelry, clothes, underwear, make-up and more for sale. 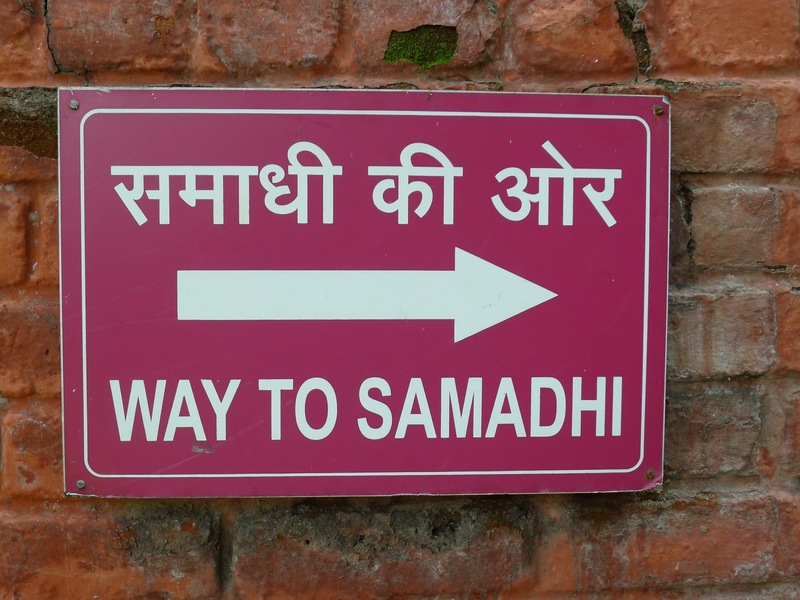 One website reports that Laxmi Road is four kilometers long. Although it felt like we walked that far, I’m sure we saw only a fraction of the area. It is an easy place to get lost in. Luckily once out to a busy street there are plenty of rickshaws to whisk us back over to our home base. Since about Tuesday people have been wishing each other Happy Diwali. For a week or more the shops have been selling lights and candles. There has been a festive mood in the air. And every night fireworks have been going off in the neighborhood. 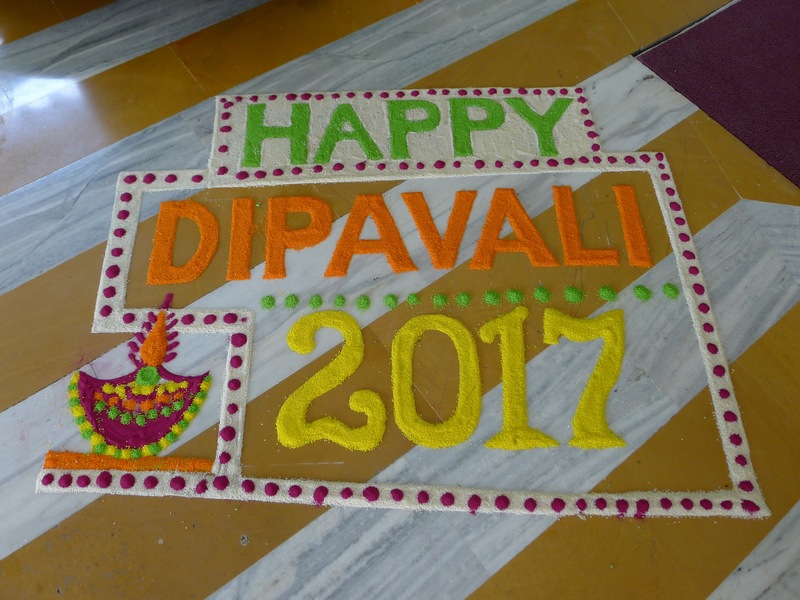 Diwali is India’s Festival of Lights, a time when people come together to celebrate good conquering evil and light conquering dark. It is a celebration of new beginnings which coincides with the beginning of the Hindu new year. It’s the biggest event on the Hindu calendar and has been described as “their Christmas”. 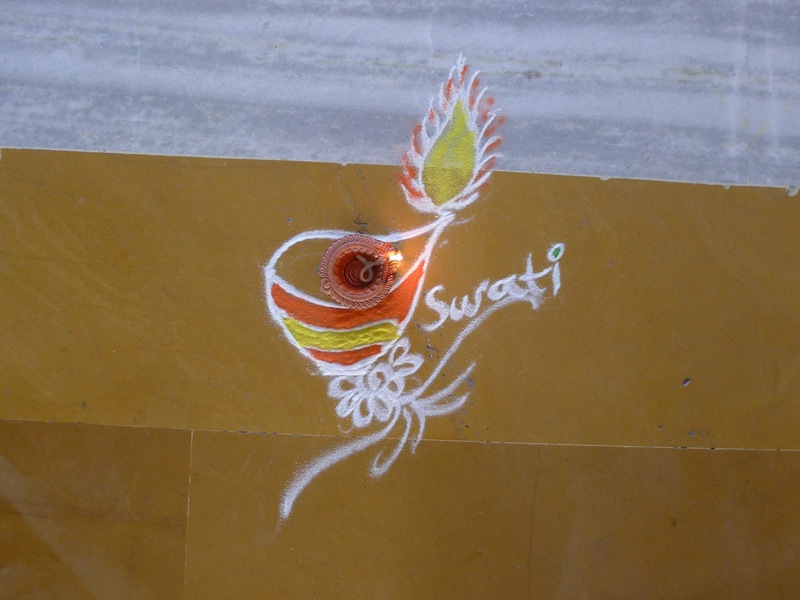 The exact dates of Diwali change each year and takes place over five days. It’s usually sometime between mid-October and mid-November, the exact dates based on the Hindu lunar calendar. 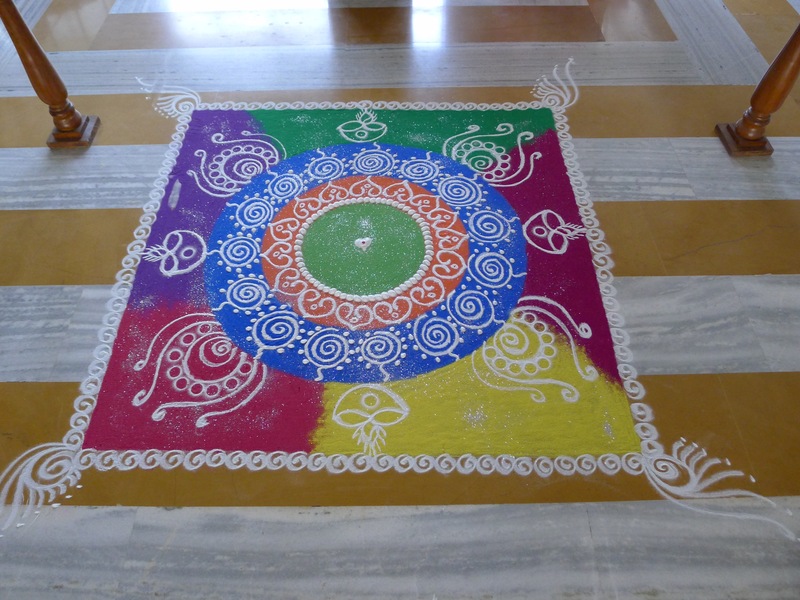 In addition to fireworks, candles and lights, there are Rangoon artworks on floors. 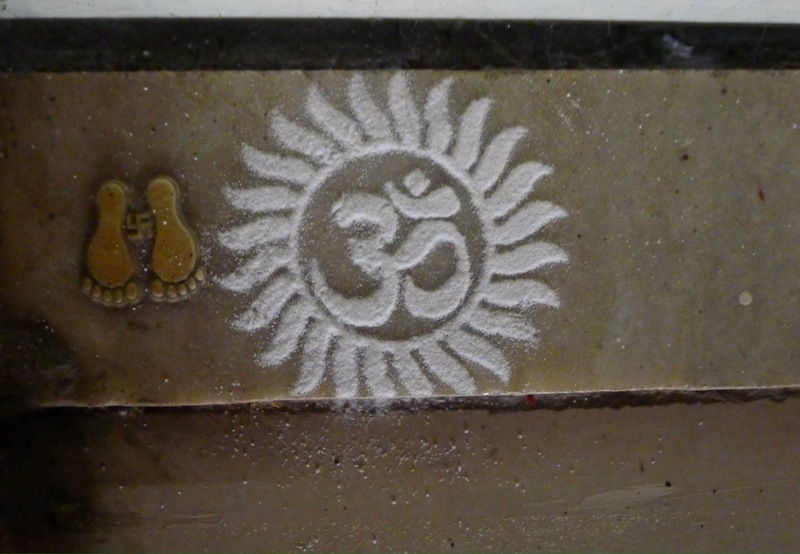 We saw these on the floor of the hotel in Aurangabad, on the ground in front of the restaurant, Indiana, where we ate twice in Aurangabad, and when we returned to the apartment there were two Oms on the threshold. They are made with colored rice, sand, flour and petals. 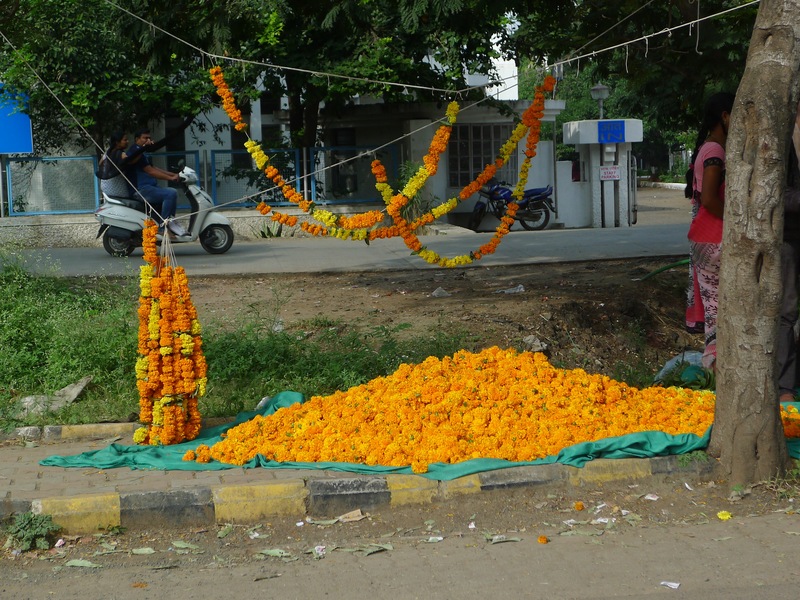 And everywhere there are marigolds. They adorn cars, motorcycles, doorways and are for sale in big heaps on the side of the road. 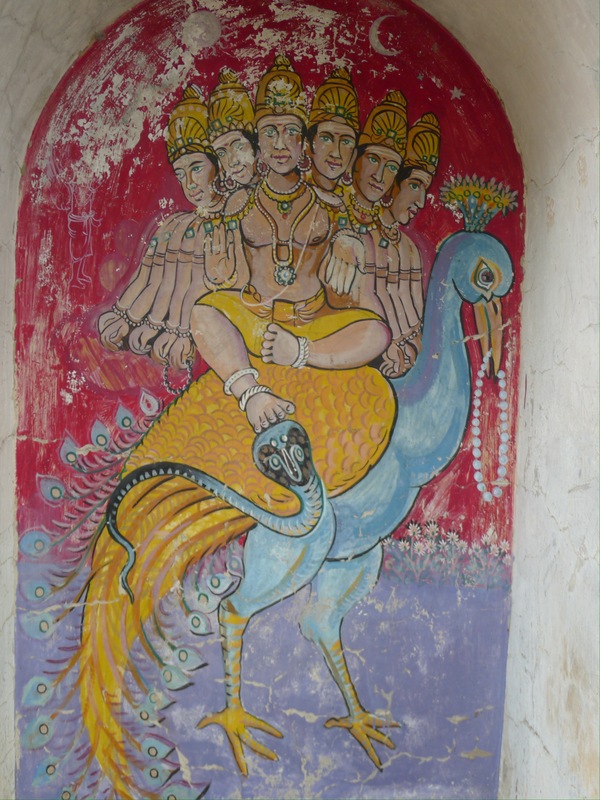 As our tour manager said many time during the first part of our trip, India is a country of myths and legends. Different parts of India celebrate different legends during Diwali. 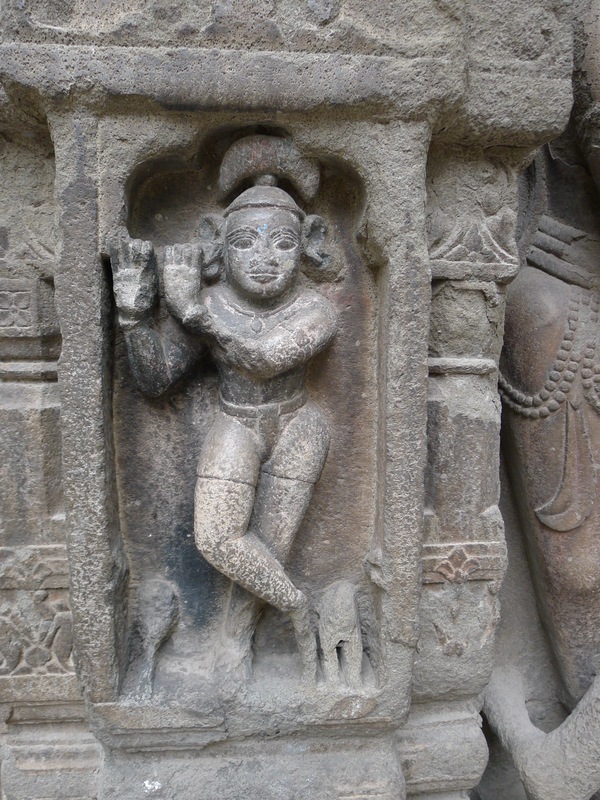 In the north the festival celebrates the return of Rama and his wife Sita from their 14 year exile. 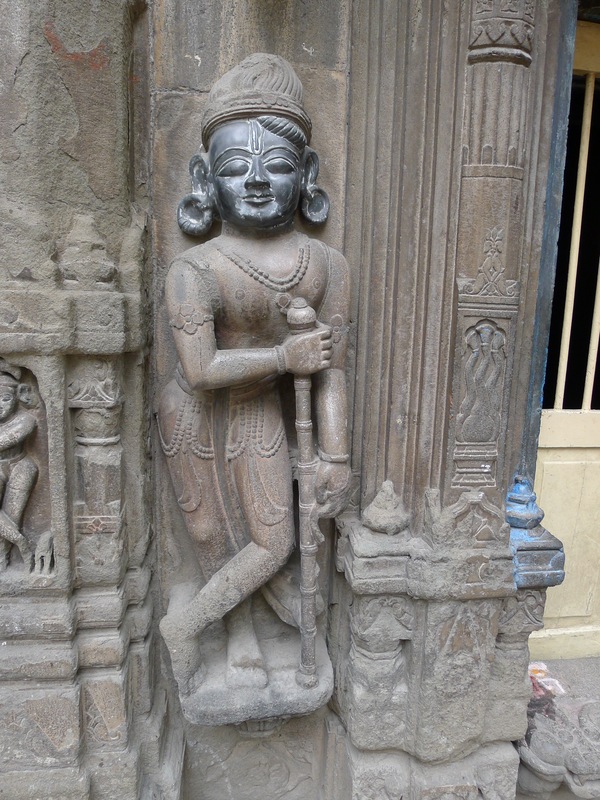 Elsewhere many link Parvati, the goddess of love and devotion to Diwali. 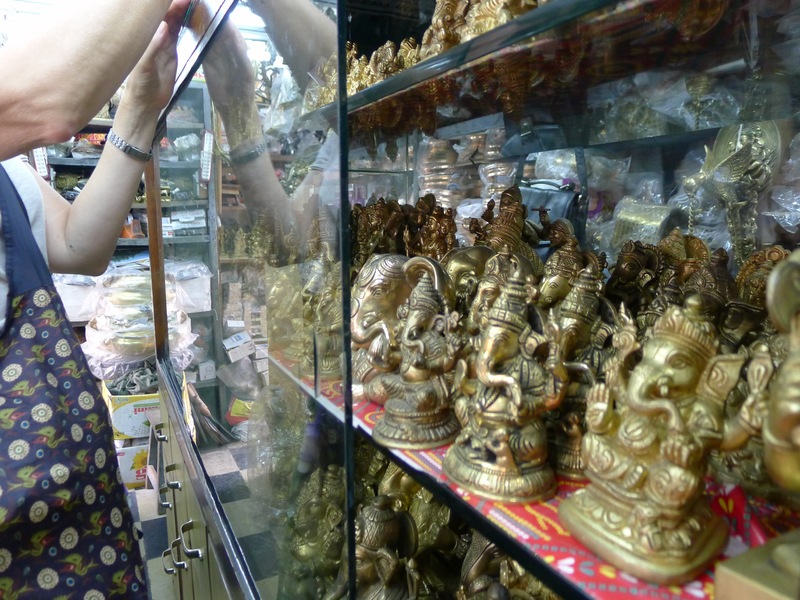 For others, the Festival honors the goddess of wealth, Lakshmi, allowing the lamps to help her find her way to homes and businesses so she can bring them wealth on this holiday that coincides with the start of the business year. And everywhere it includes lighting fireworks! 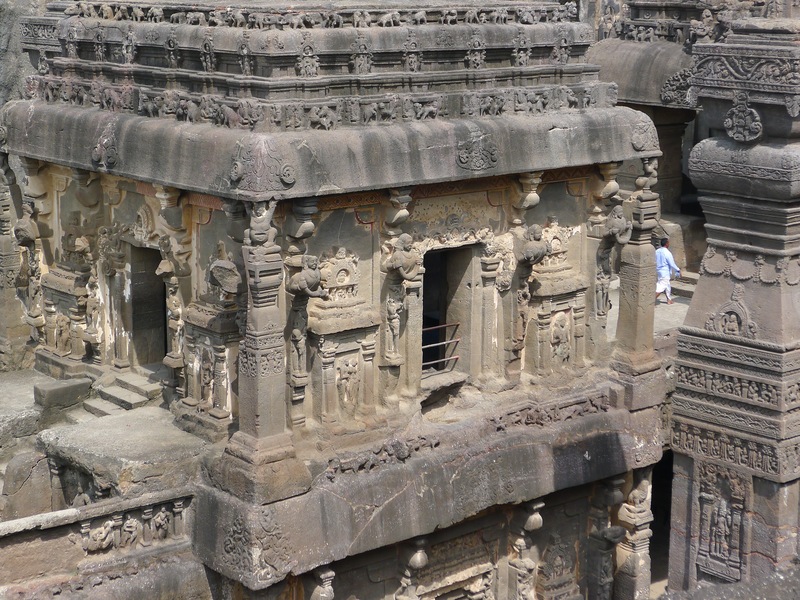 Carved out of the vertical face of the Charanandri Hills between the sixth and tenth centuries these “caves” are awe inspiring and magnificent. Some are in complete and others are filled with carving, benches, and temples. There are thirty-four caves in all; 12 Buddhist, 17 Hindu, and five Jain. Each is numbered, some have a short explanation, and all of them carved out of rock, most, as I understand it, from the top down. 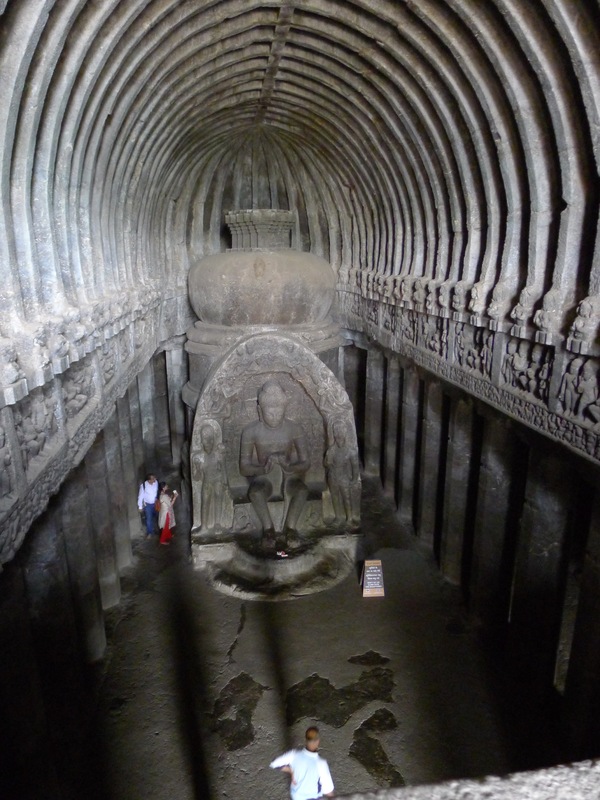 The oldest caves are the Buddhist ones, carved from 500 to 750. 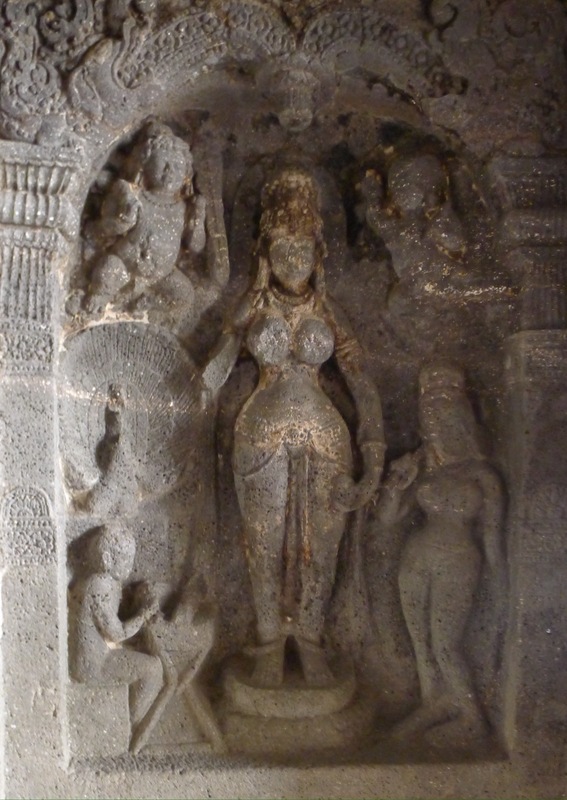 The Hindu caves were carved from 600 to 870 and the Jain from 800 to 1,000. The most impressive was number 16. It is a magnificent temple carved from solid rock. 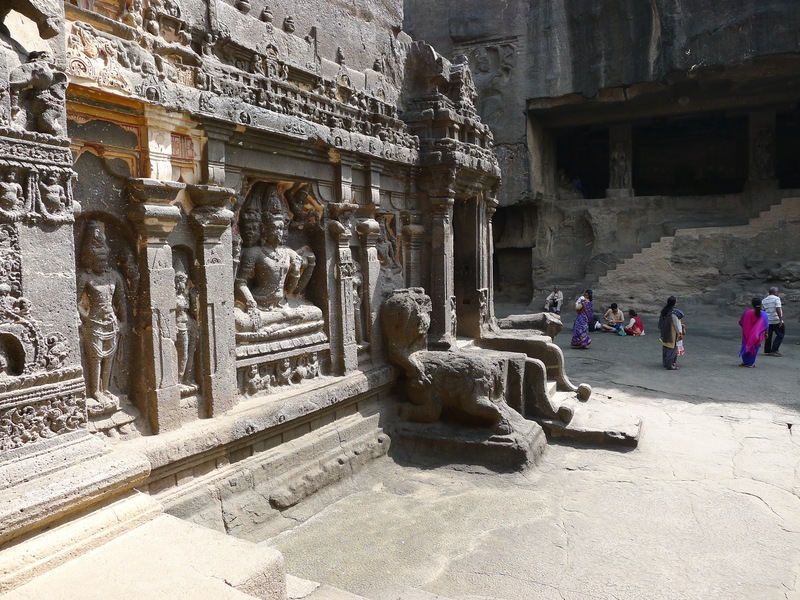 The sacred destinations website reports that 250,000 tons of rock was removed and it took 100 years to carve. It is twice the size of the Parthenon in Athens. 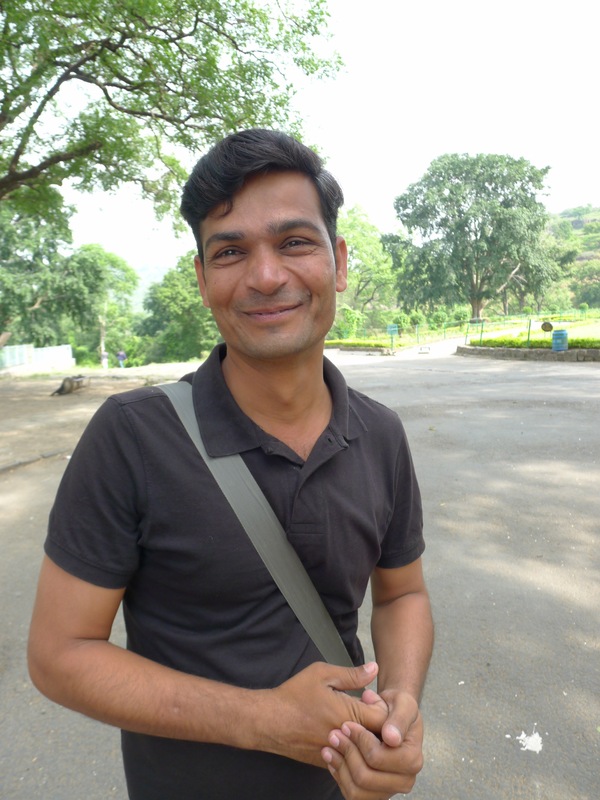 We hired Ali, an entrepreneur in the area, to drive us from our hotel in Aurangabad to the caves. He handed us over to Onis, a lovely gentle helpful man who helped guide us. We made it through ten or twelve and started to tire. We relied on our guide to help skip some and to focus on the most important. 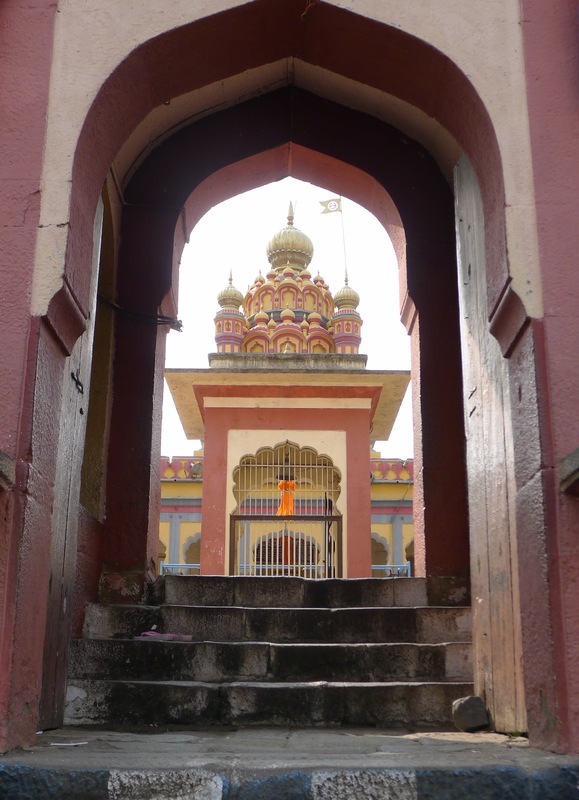 We skipped about ten of the Hindu caves and walked a kilometer or so to the Jain caves. It was warm, but not as humid today, but the heat and climbing up and down the stairs wore me out. 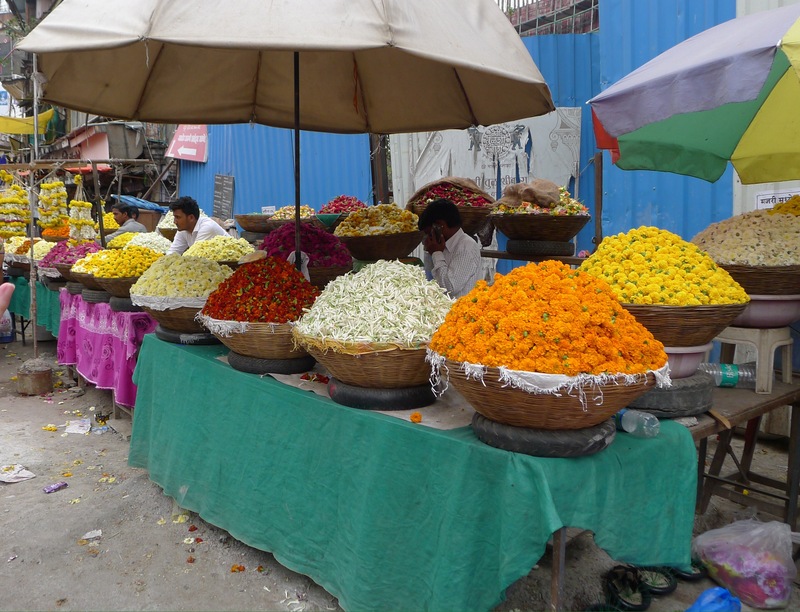 I thought I would write some of my general impressions of India through the lens of the senses. There are so many differences between this country and mine. It is hard to know where to start. I will start with smells. When there are as many people in one place as there are here, it takes some doing to move them from place to place. When in the auto rickshaw it is the overwhelming smell of exhaust that I notice. Busses, cars, motorcycles, auto rickshaws all spew fumes. Many, I suspect, would not pass emissions testing elsewhere. The heat and humidity, of course, is a major component of living here. My towels and washed clothes don’t dry as quickly and that leads to a stinkiness. On the flip side, our cleaning lady, Nanda, comes almost everyday and our apartment will have that pleasant scent of lemon cleaning solution after she is done, particularly after cleaning the floors. Alternately, our place fills with the aroma of food cooking when our cook, Aneeta, comes. When people are in the heat so much, they sweat. That in and of itself leads to a certain kind of smell. One day I went to the “Western” shopping mall to look for a bra. I brought a couple of very old ones with me with the intent of tossing them at the end of the trip. Several days I put it off, feeling to sweaty and stinky to even step foot into a fitting room. Last week, feeling less hot and sticky than other days, I popped over to take a look. I think it was Wednesday in the middle of the afternoon and there were at least eight young women working in the lingerie section. The stores tend to employ way more people than we do in the states. All eight of them were gathered in a circle, chatting. Two approached me, one saying “Yes, Mum”. It must be a leftover thing from when the British were here because this greeting happens frequently. She kindly helped me find a couple to try on and while letting me in the fitting room I could smell her body odor. This has not been the only time this has happened. It is just the way it is. Across the “busy road” is the School of Agriculture and we have taken some walks in there. The trees grow tall in most spots on the campus with open fields behind the buildings where the crops grow. There is one spot the first couple of weeks that was filled with the sweet smell of flowers. There aren’t many gardens or flowers here. At least not visible from the streets and sidewalks. Our apartment building is next to another, which is next to a wall. One day we took a walk on the other side of that wall by mistake and found small huts, with lots of people living there with dogs and goats. It was the only time I have felt like I was in the wrong place since I have been here. A good number of mornings I wake to the smell of fire, which I am guessing is the way those folks are making their morning chai or breakfast. The first couple of mornings I though the apartment was on fire and woke with a start. 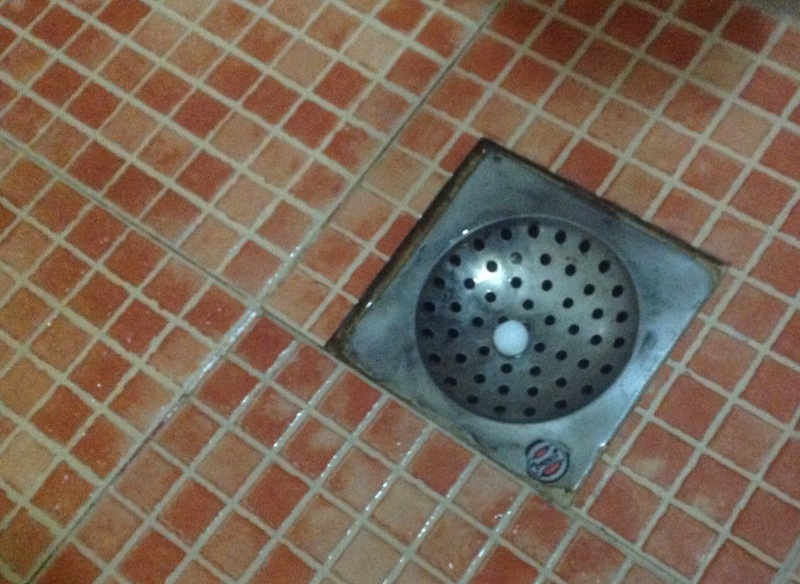 Like every drain I the apartment, my attached bathroom drains have small moth balls in them “for the bugs” I have no idea what kind of bugs or why they would be in the drain, but the bathroom has a hint of mothball smell. While in class, particularly in pranayama or in savasana it is a surprise to me that something will noodle it’s way to my sense of smell: incense, the smell of DEET, or some baked good just out of the oven. Or maybe the baked good smell is in my imagination.